You have likely heard of the air conditioning brand, Carrier. Well the company was named after the inventor of the first air conditioning system, Willis Carrier. As an electrical engineer, Carrier set out to design a solution for the humidity problem at a publishing company in New York. Apparently the warm, humid, Summer air was causing problems with the paper stock making it difficult to add ink to the paper. The idea was rather genius. Carrier used treated air that was blown across chilled pipes which reduced the humidity of the air and also cooled the environment, and the air conditioner was born. The process that the air conditioner employs is very simple really. It is based on a commonly known scientific principle. Coupled with some mechanics an air conditioner simply converts a space like your home or office into a refrigerator. Air conditioners work on principles of physics by converting liquid into gas in a process known as phase conversion. As this conversion takes place heat absorption occurs. By using special chemicals to evaporate and condense in a closed system of coils, heat absorption takes place at a higher rate. These chemical compounds, called refrigerants change at relatively low temperatures. Fans that blow the warm air over the coils allow the air to make contact with these extremely cold coils and cool the air. As the hot air passes over the cold evaporator coils, the heat is absorbed as the refrigerant changes from liquid to gas. To get the gas back into a liquid form again in order for the process to repeat and keep things cooling efficiently, a compressor is used. The compressor essentially puts the gas under extreme pressure. This, of course, produces heat which is evacuated outside away from the area being cooled through what are known as condenser coils and a second fan. Now with the gas cooled it becomes a liquid and the process continues. And so what you have going on in any air conditioning system is a cycle where refrigerant cools the indoor air, causing the gas produced in the exchange to move to the condenser where it is compressed and converted back to liquid again. Pretty remarkable use of physics! As a part of your air conditioning system there are many components. Understanding the job of the air conditioner makes understanding these components more intuitive. Of course, the main job of an AC Unit is to cool the air inside your home or office. But air conditioners also do the work of monitoring and regulating the air temperature. To do this it uses what is called a thermostat. In addition, air conditioners are fitted with filters to clean the air as it cools the air. But wait there’s more! Remember the introduction to this article? Air conditioning units also relieve the relative humidity of the environment that it cools. On one side of the equation you have the cold air side. This consists of the evaporator and a fan which blows the warm air over the cold coils and into the room effectively cooling the room. 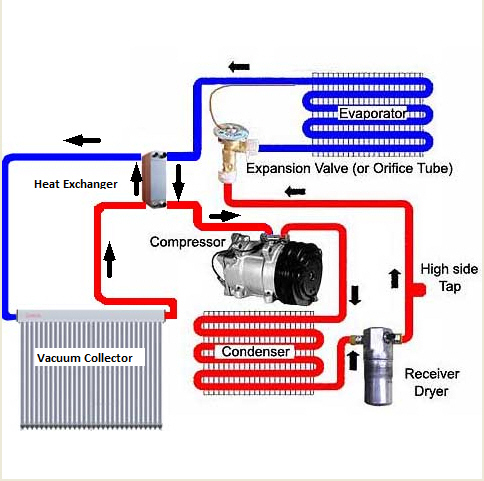 On the other side of the equation you have the hot side which consists of the compressor, the condenser and another fan which serves as a vent to blow way the hot air coming off of the compressed refrigerant that moves into the evaporator. But between these two sets of coils (cold and hot) is what is known as an expansion valve. 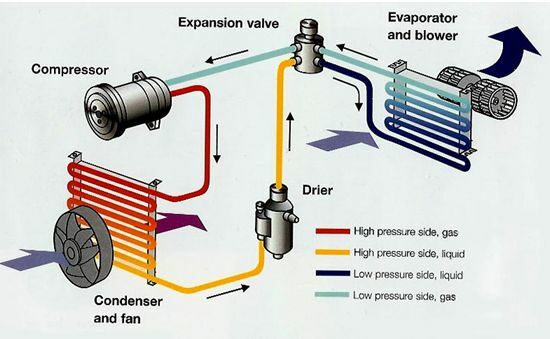 The expansion valve regulates the amount of compressed liquid that that moves into the evaporator. When the liquid reaches the evaporator the pressure drops as it expands back into a gaseous state. Essentially a compressor is an electric pump that is used to pressurize the refrigerant gas, converting back into its liquid state. While there are other smaller components like sensors and such, these are the main components of your AC Unit. What Happens When The Parts Don’t Work? As you have seen all of the components of an air conditioning system work together to create a cool environment in your home. When one component of the system breaks, the whole system fails. There are many factors which can cause the failure of one or many of these components. They are too numerous to contain in this one article; however they can be reduced to two major problems: Mechanical and Chemical. Mechanical failure involves any of the physical components of the system such as operational failure of the parts. Chemical failure involves the refrigerants used inside the closed system. If a part breaks or the chemicals leak then the system fails. This is where having a qualified air conditioning repair service like Air Systems Texas is so important. Air Systems Texas is Friendswood’s most requested air conditioning and heating service. Our qualified air conditioning service technicians have the experience to assess and determine what your air conditioning system needs to operate at full effectiveness. 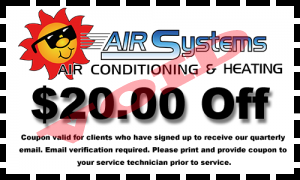 Air Systems Texas offers AC Repairs, Maintenance, and new installation of air conditioning units. Air Systems Texas has partnered with the very best air conditioning manufacturers to deliver the highest quality, and dependable air conditioning systems available. If you need help with your air conditioning system because you notice that it is not cooling properly or efficiently, Air Systems Texas will gladly offer a free estimate and discuss your air conditioning needs. Call us today or fill out our contact form below for fast, reliable, affordable air conditioning services. Contact Air Systems Texas Today!